Lava flows south of Arsia Mons in Daedalia Planum transition from younger flows with elongated, sinuous morphologies to the northeast, to older, broader lobes and sheet flows to the southwest. (The time scale we’re talking about is approximately 100 million to 1 billion years.) At the southern margin of the Tharsis region, older, probably 3-billion year old volcanic plains have been identified where Tharsis flows contact the ancient highlands. The high-resolution of HiRISE images allows for reconstruction of complex volcanic surfaces, including delineation of individual flow lobes and superposition relationships within a flow field. This image shows a contact between two of the younger, elongate flows to the northeast. 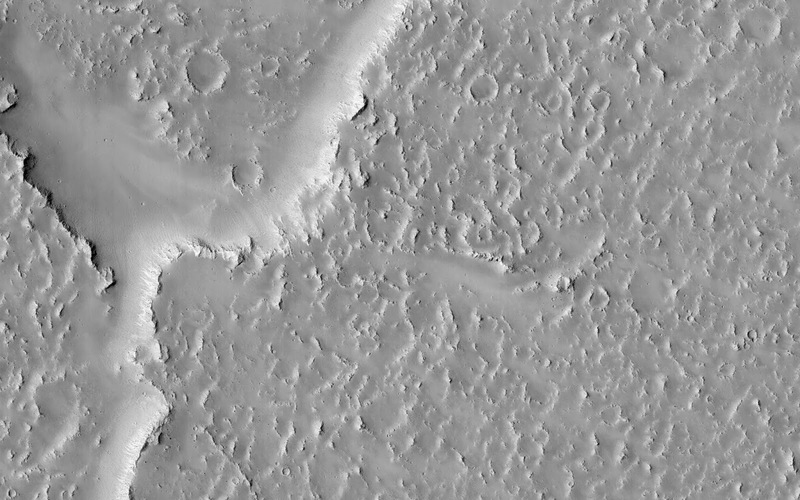 Populations of small, superposed impact craters can be used to derive relative and absolute age constraints for individual flows and flow sequences. Note: For more information, see PIA18807: Overlapping Lobate Lava Flows in Daedalia Planum.